November 6, 2018 – Washington Conservation Voters (WCV), the state’s political voice for the environment, was among the top organizations in the state investing resources and grassroots to elect over a dozen candidates to the Washington State Legislature. 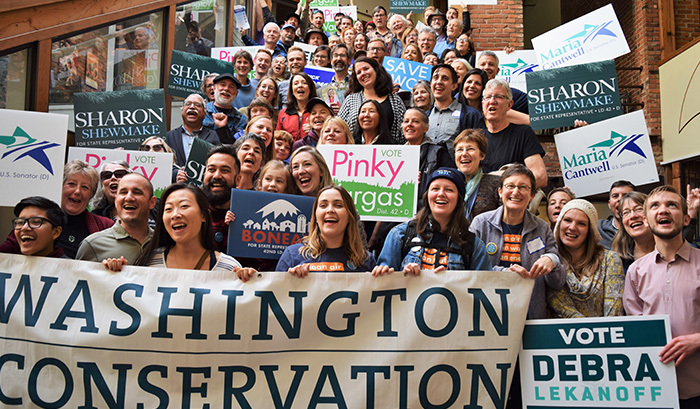 Washington Conservation Voters raised and spent nearly $850,000* and knocked on 82,000 doors to elect the largest class of environmental state legislative champions in at least a decade and increase the environmental majorities in the state legislature. WCV had over 1,100 volunteers and 1,450 donors supporting the effort. Candidates with strong environmental backgrounds include: Pinky Vargas (LD 42 Senate, Whatcom County), who championed clean energy on the Bellingham City Council and helped businesses with energy efficiency; Bill Ramos (LD 5 House, East King County), a former US Forester who owns a small business focused on transit and transportation options; and Debra Lekanoff (LD 40 House, Bellingham), a long time tribal leader and advocate of the Salish Sea. Altogether this election cycle, WCV invested in nine legislative districts, reaching tens of thousands of voters at their doors and hundreds of thousands more by TV and digital advertisements. Partnered with New Direction PAC in a mail, canvass, digital advertising, and cable TV program totaling over $4 million. Partnered with Our Votes Count PAC, a coalition focused on engaging low-propensity voter turnout on canvass, mail, and digital program totaling $400,000. * This includes separate investments and programs from Washington Conservation Voters and Washington Conservation Voters Action Fund. Washington Conservation Voters (WCV) ensures Washington’s decision makers keep our environment protected, healthy, and vibrant. Over the last 35 years, we have elected environmental champions, held our elected leaders to the highest standard, and built statewide momentum for environmental campaigns through innovative voter outreach efforts and community organizing. Through our work, WCV is committed to making sure all people in Washington state have a healthy environment and a strong, sustainable economy. Join us to get breaking news and alerts! Do you want to make Washington’s environment a political priority? You can! Give to WCV today.